With a marketplace packed with competition, launching a successful app in today’s mobile ecosystem is now more difficult than ever. Apps need to differentiate from the other 1.2 million apps in the app store, in addition to the other apps on each users device - which is roughly 26 on average. Even with 50 million mobile apps downloaded every day, user attrition is at an all time high - 95% of apps are abandoned within a month, 1 in 4 are abandoned after a single day. That leaves an elite 5% of apps that are able to hook users. Apps that demonstrate staying power and retain users for as long as a month are clearly doing something right: in order to end up in the 5% of apps that survive, developers must design an app that is sticky and that provides an immediate solution to a user’s problem or need. Doing this effectively involves an understanding of what those problems and needs are. This is incredibly daunting. Users care most about apps that deliver value and functionality in frictionless, intuitive ways. They desire apps that make their lives easier, richer and less annoying so that they can focus on what they really want to do. Only those apps that deliver personalized experiences that fit into the context of their users’ day-to-day lives will succeed. Contextual data is critical to delivering the most relevant and valuable experiences to users in real-time, as well as driving global optimization of an app to suit the entire app audience better. Many developers begin the process with their own intuition and build an app addressing their own problems, needs and desires. The important thing to remember is that you are not building the app for yourself - your users might want to interact with the app in a different way. Take an empirical approach and study, test, learn and analyze who your users are and how they behave. Gathering real world context of a user’s lifestyle is now a reality. More data resources and analytics tools provide richer insights into users’ behavior and interest. Your first step to building a successful app is to gather and interpret as much contextual data on your users as possible. Only then can you build an app that becomes a vital part of the user’s daily life. As an app developer, the end goal should be delivering personalized experiences to each individual user. Each new generation of mobile devices contains exponentially more sensors. Gyroscopes, compasses, Bluetooth and NFC chips abound. And each one holds the key to more and more user context. App developers increasingly are tapping into those sensors to better understand their users’ real-time needs. Learning about your users is no longer limited to the relationship between your app and the device your app is running on. At the WWDC, Apple released iOS 8 Extensions, which allows for third-party app integration, a feature that developers have long craved. Previously, Apple did not allow apps to communicate with each other, forcing them to operate in their own sandboxes to ensure security. With Extensions, apps will remain in their own sandboxes, but now Apple will allow apps to talk and work with each other without jeopardizing security. Now developers can gather valuable user data from other apps to better understand users and can personalize experiences with much more than just device sensors. Amazon seeks to understand users in order to provide personalized product recommendations. With Extensibility, the Amazon app can integrate with an app like Ski Tracks, which uses accelerometer to gather data on a user’s ski run, to see how advanced of a skier the user is. With this data, Amazon can offer relevant products and deals based on the user’s personal needs. The most established mobile tools can tell developers how users are using the app, for how long the user engages and which buttons they press, but can’t tell you anything about the needs and desires of the individual users. The fact that apps can now exchange data with each other is a huge advance in the age of context and is an extremely timely and convenient way to gather a new layer of user data. Human understanding, in the form of demographics, interests and intent is an essential part of building a successful app. 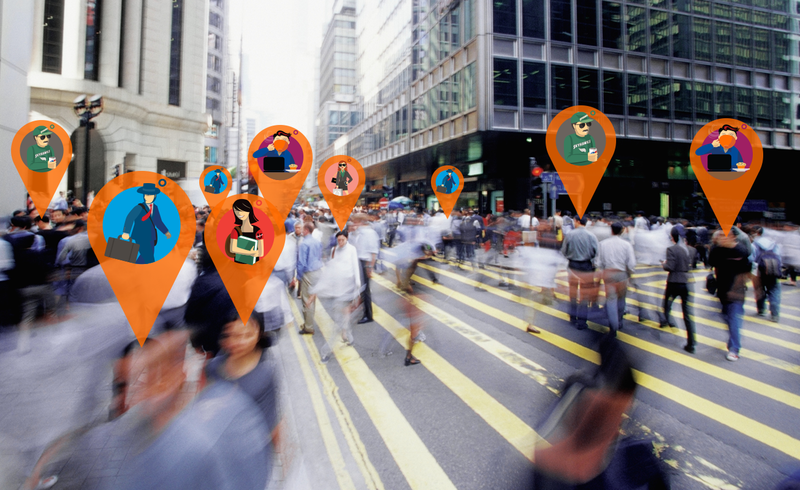 App developers can leverage the power of accurate location in a systematic and quantifiable way to learn about their users in the context of their daily activities. Location-based context can tell developers where people are using the app -- is it at home, while commuting, at work or at the gym? When are they using it -- at night, or when they first wake up? Knowing this contextual information on the user allows developers to understand how the app fits into a user’s life. Learning about how users interact with the app can influence efforts to build features that maximize utility based on the context in which the app is used. Building contextual personas is a lot of work. However, Skyhook’s out-of-the-box Personas are market-ready for developers to customize content or pass anonymized user data to advertisers or other third party partners. Skyhook’s personas combine census demographic data--like income level, education, age and ethnicity--with behavioral data based on where users go and when. These Personas provide powerful insights into affinities and intents, enabling developers to enrich their user experience with contextual data on user lifestyles. A better understanding of the users allows you to identify your most valuable, most engaged and most loyal users. The ability to understand how they use the app and what features they value can make the difference between the life or death of an app. Tracking user behavior can be sensitive, which is why Skyhook builds anonymized personas without ever using Personally Identifiable Information (PII). We honor opt-out layers and offer our own consumer opt-out on our website. This method empowers developers to access powerful contextual data about segments of their audience without compromising individual privacy. Learning about users is a continuous process. Spend time building a First User Experience (FUX) that is structured to help you build personalized experiences as quickly as possible. The FUX is another great opportunity for you to collect more data on individual users as they navigate through the app and choose their preferences. 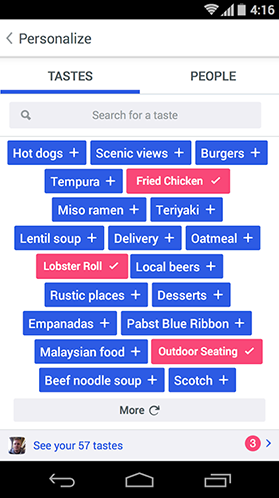 Foursquare recently rolled out a new FUX where users are immediately capable of building their own user personas by selecting what they like from a list of options. Now every time users open foursquare after the FUX they receive a personalized experience tailored to their individual preferences. After you have this opportunity to collect data on individual users, you can launch them into an experience that really matters to them based on the things they just told you during the FUX. For example, Foursquare asks the user to select the foods they like in order to guide them to nearby restaurants that offer these foods. Understand and analyze who is unlocking the features of the app and how long it takes them to do it by looking at how many clicks a feature gets and when the clicks are happening. Look at the most popular clicks vs. what is not being clicked on at all. Look at the types of personas that are clicking on certain features and learn what your users’ pain points are by watching them perform the tasks you care about in their own environment. Gathering contextual data allows you to better understand and anticipate your users’ needs in order to deliver dynamic user experiences that respond to the user’s intent, adapt to the user’s location, change based on time of day, and tune to the user’s skill level. Implementing a dynamic user experience will ultimately result in better ratings and reviews to stand out in the app store, leading to lift in average session length, growth in daily active users and growth in sessions per day. Great UX is important for user engagement but also critical for monetization and revenue. In the last year, app developers have quickly shifted their monetization strategy toward in-app purchases and in-app advertising. 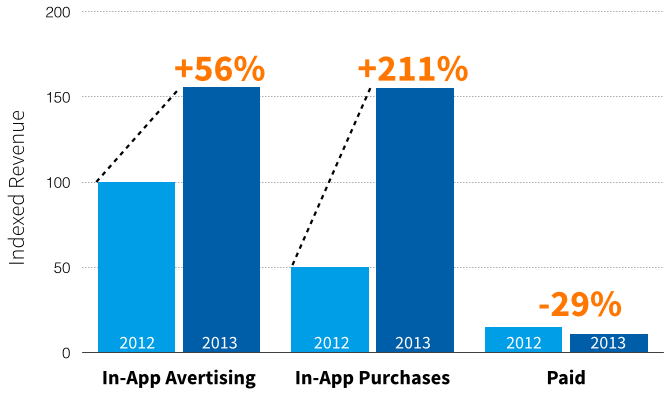 From 2012 to 2013, in-app advertising revenue increased by 56%. And in-app purchase revenue increased by 211% according to a joint study by AppAnnie and the IDC. For developers, growing mobile app revenue is not about how many people pay to download an app. It's about getting the app into as many hands as possible and getting those users addicted to the app. An engaged user base maximizes ad impressions and add-ons purchases of virtual currency and premium features. Apps are now more dependent than ever on having a great UX because keeping the user engaged with the app is not only about improving metrics, it’s also about increasing revenue.